Registration period now open for the summer courses of the prince of Asturias foundation’s. Classes will be taught by internationally renowned teachers from 21st July to 1st August. The Prince of Asturias Foundation´s International Music School has opened this 4th May the registration period for its 14th annual Summer Courses, which will take place at the "Eduardo Martínez Torner" Advanced Conservatory of Music and the Prince Felipe Auditorium, both in Oviedo, from 21st July to 1st August. Students can enrol via the School´s website www.escuelainternacionaldemusica.org or by filling in the application form available at the Prince of Asturias Foundation´s the offices: C/ General Yagüe, 2 / 33004 Oviedo. The deadline for enrolment in the course is 11th July. Classes will be taught by a teaching staff of international acclaim that has included amongst its guest teachers some of the most internationally renowned musicians from centres and orchestras such as the "Gnesin" Russian Academy of Music in Moscow, the Royal College of Music in London or the London Symphony Orchestra, among others. Thirty-five professors from ten different countries will be giving lessons, which will encompass the range of symphony orchestra instruments in addition to ensemble classes such as chamber music, string quartet, wind ensemble, folk music ensemble, youth orchestra and junior orchestra. This year, the School expands its department of voice, teaching for the first time the subject of Baroque Opera Performance. In addition, there will also be a workshop that combines music and tai chi: the search for harmony, and the new subject of Jazz Music Ensemble. Yuri Nasushkin, the artistic director of the School, is a professor at Oviedo´s "Eduardo Martínez Torner" Advanced Conservatory of Music. 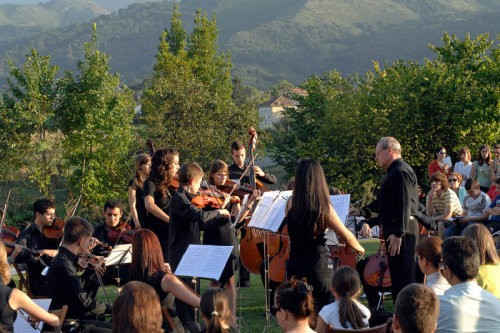 He has also been the director of the Principality of Asturias Youth Symphony Orchestra (JOSPA) and of the Youth Orchestra of the Community of Madrid. Nasushkin arrived in Spain in 1990 as a professor of the Soviet chamber orchestra The Moscow Virtuosi.